Picture this…cream, smooth, icy fruit sorbet in minutes… with your juicer! Believe it or not, your gear juicer can make a great healthy ice cream. I actually didn’t start making my own sorbet with my juicer until a few years ago. I never really thought that I could. Good news is that it’s super easy, super simple, and pleases the whole family. I especially find it a great treat to have at night when winding down before bed, or to give kids as a healthy dessert. There are two ways you can make fruit sorbets with your juicer. Are you ready for the super simple recipe of a healthy juicer ice cream? Step 1) The Ingredients: the fruit. Get some frozen fruit. Buy some at the supermarket or freeze some fresh (always the best) the day before you plan to make your sorbet. The best thing about this recipe- it’s easy to keep fresh frozen fruit in the freezer. If you always have a stock of frozen fruit, you can always make this ice cream in a flash. Using the whole fruit allows you to get all of the fiber into the sorbet. Save some fresh fruit juice and pour it into ice cubes. Let it freeze.. This is more time consuming because you have to think ahead and save /freeze the juice. However, you can make much more unique concoctions and add in things like vanilla, sugar or honey if you want. Because juicing removes the fiber from the fruit, this creates a smoother and more water based texture. It’s really just a personal preference on which you choose. I prefer the frozen fruit method because its easier. Best fruits for a juicer sorbet are peaches, strawberries, mango and pineapple. While all fruit can work, those tend to work the best(especially with frozen fruit). The most wonderful part of juicer sorbets is that you can mix and match to make your own concoctions. Keep reading for some good recipe ideas…. Step 2) Prepare your juicer on the homogenizing function (i.e. for most, remove the mesh screen and replace it with a blank plate). All models are different so you’ll want to read your instruction manual for homogenizing. Place a bowl at the end of the juicer to catch the sorbet. Step 3) Process the frozen fruit or ice cubes through the juicer. This is similar to the banana ice cream. If you have trouble with bouncing berries or small fruits jumping, make sure you have the tamper in hand to smoosh it down. Beautiful, smooth fruit sorbet will exit the end of your juicer. P.S.- You can make an easy sorbet if you have a Vitamix high power blender, too. Here's a video that shows you how. It's really easy and the same recipes and techniques apply. Instead of running them through your juicer, you would just blend on high using the tamper like the women demonstrates below. 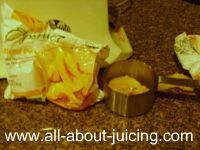 If you don't have a Vitamix, then scroll down below to get recipes, topping ideas and see pictures of how I made peach dessert with my juicer. My top five recipes for homemade fruit sorbet! Strawberry Mango: Process about a cup of strawberries and a cup of mangos. Top with fresh slices or strawberries. Plain Peach: Process 2 cups of peaches through the juicer. I’ve noticed that frozen peaches tend to have a bitterness to them when made into the sorbet. Topping it with honey or crystallized ginger is a nice accompaniment. Pineapple: I love processing about 2 cups of frozen pineapple and topping it with my homemade chocolate sauce! 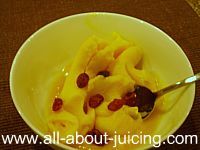 Plain Mango: Mango always turns out fantastic as a healthy treat. It has that great tropical taste and always has a good amount of sweetness. Coconut: Oh yes you can! Freeze some fresh coconut, making sure all the brown shell is removed. Young thai coconut juice frozen into ice cubes works well too. Process through the juicer for a super treat. Mix in some vanilla for a different taste. Instead of having your ice cream in a bowl, try scooping it into an ice cream cone (great for kids)! Put it in a glass ice cream bowl making layers of sorbet, yogurt and granola. Try topping with coconut flakes, white or milk chocolate chips (yum on raspberry sorbet), dried fruit or fresh chopped nuts. Make fruit syrups by processing fresh fruit (not frozen) through your juicer with the blank plate still in place immediately after making the sorbet. 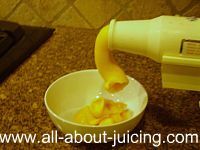 The fresh fruit processed through the juicer will make a sweet sauce. It works the best with berries, especially blueberries or raspberries. Top yours with some homemade whipped cream and fresh fruit. This peach version is so super simple if you have a gear jucier. Prepare your juicer to homogenize. 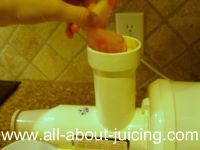 In these pictures I'm using a Champion Juicer. If you have this juicer, you need to replace the juicing screen with the blank plate(so that it just pulverizes the fruit, picture below of the Champion Juicer blank plate). I measured out about 2-3 cups of frozen peaches and processed it through the juicer. It will produce a very fine sorbet! I added some honey and cranberries as a topping. Heavenly!! Are you looking for a juicer that is able to make healthy frozen treats?